There are so many great conversations on the Hotline — it’s hard to choose a favorite. But we’ll be doing it every day leading up to Thanksgiving to spread the wealth of our community’s knowledge — and to help you host the least stressful Thanksgiving yet. No promises on the crazy relatives. Today: We’re breaking down the basics of brining. Tomorrow we’re cooking up the best ways to accommodate special diets without losing your mind. Michael Ruhlman thinks cooking is all about basic ratios, and brining is no different. His ideal brine is 5%: “That means 50 grams of salt in a liter of water, 1 ounce of salt for every 20 ounces of water, or for those poor souls without a scale, 2 tablespoons Morton’s coarse kosher salt for every 2 1/2 cups water.” If you’re in a time crunch and need to brine more quickly, follow his guidelines for making a stronger brine. Virginia Willis reminds us that all salt is not created equal, so it’s important to consider the size of the grain of salt that you’re using in a brine: “Table salt is very finely grained, whereas kosher is larger. However, there are two brands of kosher salt widely available with different size crystals: Morton’s and Diamond Brand. Morton’s kosher salt is more compact and denser with smaller crystals. Because of the differences in the size of the crystals, 1/2 cup of table salt is equal to 1 cup of Diamond Brand kosher salt or 3/4 cup Morton’s kosher salt. My recipes call for Diamond Brand because the conversion is easy at 2:1. 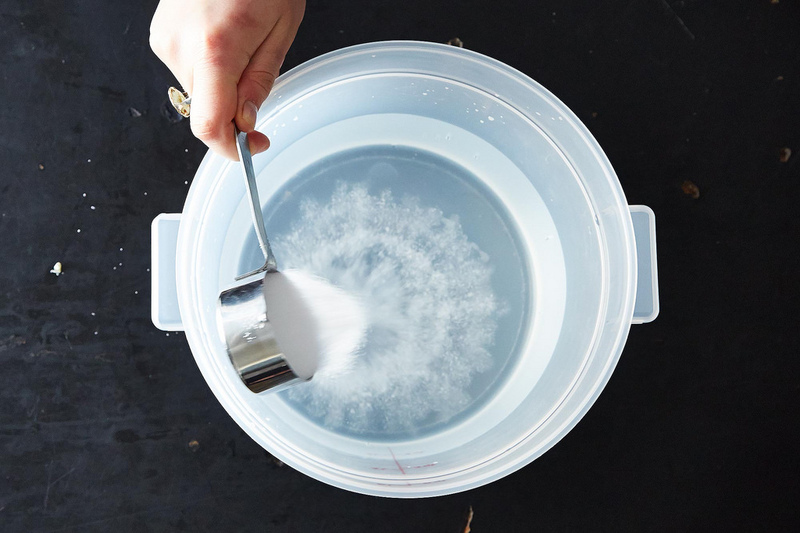 For a turkey: Dissolve 2 cups Diamond Brand kosher salt and 1 cup sugar per 2 gallons cold water for a 4- to 6-hour brine or 1 cup Diamond Brand kosher salt and 1/2 cup sugar per 2 gallons water for a 12- to 14-hour brine. 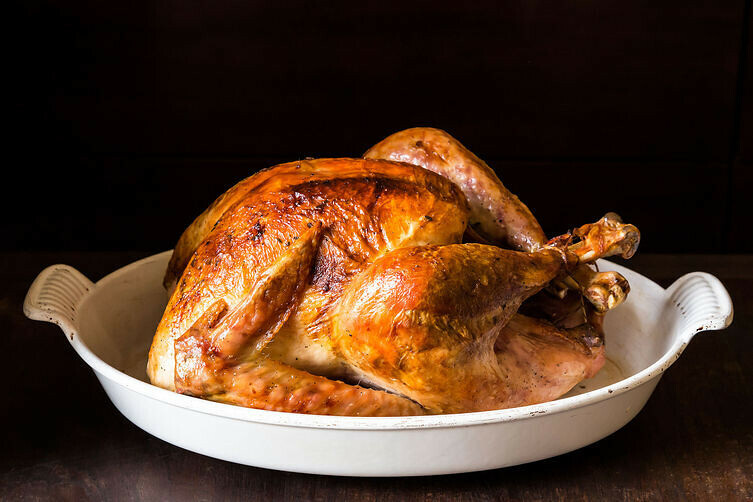 If you forget to start brining your turkey ahead of time and are wondering whether or not to proceed with a brine, Amanda Hesser says yes — even just a few hours of dry brining is helpful. Should you use a dry brine or a wet brine? Aranthi deems dry brines supreme thanks to their simplicity, minimal mess, and ability to produce a great-tasting bird. 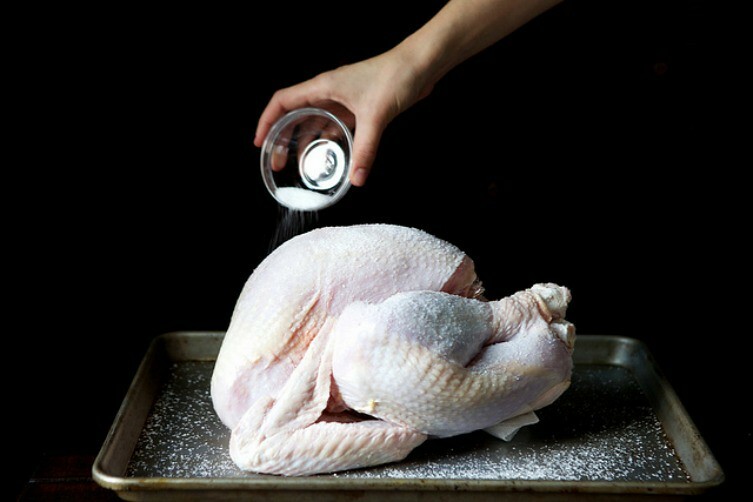 Jessica Bakes agrees — she’s found that heavily salting your turkey many hours beforehand gives amazing moisture and maintains the turkey’s flavor. Erinbdm sticks with what works. She’s done a wet brine every year, and the turkey has always been flavorful and delicious and not too salty. SKK concurs, and finds wet brines are worth the trouble due to the huge difference in taste and texture they provide. Can you brine a self-basting turkey? HalfPint recommends steering clear of the salt, and inserting a mix of a fresh herbs under the skin for flavoring, or using a salt-free dry rub on top of the skin. More: Get the lowdown on how to brine meat and why you should bother. What’s the best way to store the turkey while it’s brining? To save fridge space when it’s at a premium, Sfmiller is partial to storing a turkey in an insulated (and well-cleaned) cooler. JadeTree used to buy a big bucket every year too, but discovered that brining bags are easier to manuever than a giant sloshing bucket. AntoniaJames has more vertical real estate than horizontal in her fridge during the week of Thanksgiving, so she puts her dry brined bird in a bag in a narrow stock pot. She puts the lid on, and then usually has room on top for something else. Are you supposed to rinse the turkey after brining it? Will you be able to use the drippings for gravy? AntoniaJames prefers to plan ahead and make gravy using a stock and drippings from turkey wings, a day or two ahead of time. She doesn’t salt it, so then you can add in the pan drippings from your brined turkey for additional seasoning and more flavor. Tell us: What are your best tricks and tips for successfully brined turkeys?